Meade loaned me the ETX-125EC and the Celestron NexStar5 that were used at the "telescope party" I reported on earlier. Over a several week period I used these telescopes as much as possible and what follows is my report on the results. I had requested some assistance in this and a local astronomy professor (who has requested anonymity, which I will respect) volunteered an evening and even brought along a Celestron C5+ for comparison purposes. He does not pretend any more expertise in evaluating amateur telescopes than the learned amateurs who will read this report but his assistance was valuable. On 20 October 1999, I wrote to Celestron to ask if they would be willing to provide a NexStar5 for this comparison. There was no response. After receiving an email address for Celestron (thanks to a site visitor) I sent a follow-up request and was informed that my request was being routed to the proper person. When no additional response was received I then contacted Celestron to see if they would be willing to check out the loaner NexStar5 to ensure its optimal performance. To date they have not responded to either request. In the interest of getting some tests done I elected to proceed without Celestron's support. I am sure we all wish Celestron had been supportive of this effort but they were not (at least not yet) and so we have to go on. By the way, some people have complained (a lot) that Meade does not provide technical support using electronic mail. In searching the Celestron web site for an email address to use for my initial letter to them, it does not appear that Celestron offers technical support via email either. Just thought I would point that out. My approach to the evaluations was to try to learn to use each system as a new user would. I used each one separately on several occasions before setting them up side-by-side. I felt this was the best way to provide a standalone evaluation of each system and then compare them after I was familiar with their operation. I have not attempted to try every possible test, observe every possible object, nor perform every possible operation with each system, but I think that what I report on will be sufficiently representative. If I missed your favorite "star test" or don't report on something you are interested in, I am sorry. I had hoped to do more tests but weather, my location, work, other requirements on my time, and maintaining this web site prevented me from doing more in the allotted time. The loaner ETX-125EC and NexStar5 are being returned to Meade so I will likely not be able to answer any questions about tests not performed. However, I will post inquiries on the ETX-125EC Feedback page and hopefully other ETX-125EC and NexStar5 users will be able to answer the questions. Should either Celestron or Meade elect to provide a long term evaluation unit I will post an announcement to that effect. I have attempted to avoid errors in this report but even after repeated reviews and edits, it may still contact errors in transcription from my notes, errors in typing (typing one thing when I meant another), or errors in misreading or misinterpreting information in the manual. I will attempt to clarify and correct any such errors on my part reported by readers. I refer the reader to the ETX-125EC & NexStar5 specifications page for a detailed listing of each telescope's specs. Some of what is there may be subjective (depending on the submitter) but you can gain some valuable information from the page. Before getting into the details, I would like to thank those who sent me suggestions, words of support, and kept me going on this effort. Also, many thanks to Meade for supplying the loaner equipment. And thanks to my anonymous co-evaluator. Finally, I am certain that there will be aspects of this report that some readers will find fault with. I welcome their factual inputs and opinions just as I hope you all welcome my factual statements and opinions. Telescopes are like people; they are individuals and no two of the same make and model are exactly alike. And like people, telescopes can have their pluses and minuses in their personalities. As always, potential buyers of any product should do their own research and when possible actually experience the products before purchasing. The information supplied on this and many other web sites, newsgroups, mailing lists, and in magazines should be considered collectively when making a final purchase decision. Now, with all the necessary preliminaries out of the way, lets get on with the report. The telescope and Autostar that Meade supplied were not new ones, right out of the box. No documentation was supplied so I can not address that for the ETX-125EC. However, given that I was familiar with the ETX-90EC and Autostar, this did not hamper gaining familiarity with the system. I refer readers unfamiliar with the ETX-90EC and Autostar to the writeups available on the ETX-90EC and Autostar Feedback pages and the Autostar Information page for details. The setup and operation of the ETX-125EC is essentially the same as with the ETX-90EC, which is well documented elsewhere on this site. The Autostar came with version 1.3b of the software. I decided to not upgrade it to a newer version for these tests. But it is worth noting that the Autostar can be upgraded by the user (with the proper computer, cable, and software) and can have additional items entered into its database. The telescope was mounted on a Meade-supplied Deluxe Field Tripod (with the legs not extended) using the Meade ETX-125EC adapter plate (which provides additional stability). This plate is placed between the ETX base bottom and the tripod head. It is held in position with your hands as you tighten the screws to hold the base to the tripod. It was somewhat awkward to do this but once mounted it does work. My first night with the ETX-125EC was a short one. I did an Easy Align with the Autostar (which was successful) and my first GOTO was to the Ring Nebula, M57. The view was impressive; the central hole was easily seen in both the standard 26mm eyepiece (73x) and a 20mm eyepiece (95x). I then did a GOTO to the Andromeda Galaxy, M31. In the 26mm eyepiece it remained a fuzzy object, with no dark lanes visible from my location (unlike what I reported from the "telescope party"). Next, GOTO Jupiter; in the 26mm EP the four Galilean Moons were nice crisp points of light and cloud bands were readily visible. I then pushed the telescope using a 4.7mm EP (404x) and the cloud bands remained very clear although the moons were no longer crisp points of light. Then, GOTO Saturn; beautiful. Two moons were visible and the Cassini Division was obvious with a 9.7mm EP (196x). The Ring's shadow on the planet was also visible. Unfortunately, seeing was somewhat disturbed by a heat source and so the 4.7mm EP was unusable on Saturn. These views were more exciting than with the ETX-90, as to be expected, since the ETX-90 has a 90mm objective and a 1250mm focal length while the ETX-125EC has a 127mm objective and a 1900mm focal length. On subsequent nights, Jupiter and Saturn were always nice targets, even with the 4.7mm eyepiece. The Orion Nebula, M42, really stood out (higher contrast) with the 26mm EP versus the view in the ETX-90. There was more extent visible in the ETX-125EC than seen with the ETX-90. Most GOTOs put the selected object in the 26mm EP or at least in the Finderscope Field of View (FOV). I also used the Scopetronix 40mm eyepiece (48x) with the ETX-125EC. M42 and M31 presented very nice views. Using the 26mm EP, the Crab Nebula, M1, was an easy target. Stars in various open clusters were always nice points of light with the 26mm EP. The standard finderscope for the ETX-125EC is a right-angle 8x25mm finderscope. I have the Shutan right-angle adapter on my ETX-90RA so I am used to this orientation. There has been a lot of discussion here and elsewhere about whether a straight-through or right-angle finderscope is better. Actually, having both is best. There are times when one or the other is more convenient. Some have complained that the eyepiece of the ETX-125EC finderscope is in the way when looking through the telescope's eyepiece. But since the finderscope can be rotated in the mounting bracket this should not really be a problem. I had no problems using the supplied finderscope although I did find myself sighting along the side of the OTA to verify where the ETX was pointed before looking into the finderscope. This is something that the 1x or red-dot finderscopes do well at. I found that the use of the ETX-125EC was as to be expected for its size. Views through it were pleasing, brighter than with the ETX-90, and due to its larger aperture, it could support the use of higher magnifications than the ETX-90. There was no significant image shift. Nor was there any focus change as the OTA orientation was changed. Images were stable at all magnifications used, with any hand-induced vibrations rapidly damped out. It was more difficult to move from the house to the yard than was the ETX-90EC mounted on the Meade tripod but not by much. When not mounted on the tripod, moving the ETX-125EC was best accomplished by lifting it with the hands under the base. Due to the nature of the forks and the weight of the telescope and base, I felt uncomfortable lifting the system by just a fork arm. The motor drives are reasonably quiet while tracking, although when using the higher slewing speeds there is a very loud, high-pitched sound. Not so loud that it will wake the neighbors but they might wonder what the noise is if they are outside. The ETX-125EC has a retail price of $895 and comes with a standard 26mm Super Plossl EP (providing 73x) and a standard hand controller. The Autostar #497 has a retail price of $150. The optional AC adapter is $42. The combined price (for comparison to the standard NexStar5 configuration) is $1087. The first thing I did was to open the original shipping box. Inside was everything needed. The computer/controller, 25mm Plossl eyepiece (providing 50x), finderscope (to be mounted and aligned by the user; just like with the ETX line and most other telescopes too), and a manual. I also noted that an AC adapter was standard (optional with ETX line) although the NexStar5 can run on eight (8) AA batteries. 1. With the NexStar5 computer/controller, it is necessary to manually enter the user's latitude and longitude on first use. There are no cities in its database, unlike with the Meade Autostar. Of course, this lack of a cities list does save memory in the computer. If you take the NexStar5 on trips you will have to always have the NexStar5 manual with you as it contains several pages of cities and their locations. It is also necessary to manually enter the current month for the Tour mode every time you want to use the Tour. I thought this was strange since you have to enter the date (as well as your lat/long) when doing an Auto Alignment. Seems like the computer could have "remembered" this information. But as there is an alignment mode that does not require the date to be entered, I guess it was simpler to always ask for the date when entering the Tour mode. 2. The finderscope is a "red-dot" type, very similar in size and shape to the Scopetronix LightSight. The only significant difference is that the Celestron version has a fully adjustable dimmer whereas the Scopetronix version has a three position switch (off, faint, bright). 3. To use an eyepiece you have to attach the visual back on the rear port (the only port, unlike the ETX-125EC and ETX-90EC). You can then either use the provided star diagonal to have the eyepiece at a right angle to the telescope tube or just put the eyepiece directly into the visual back for straight through viewing. 5. The NexStar5 can run on AC power using the supplied adapter or on 8 AA batteries. The battery compartment is easily accessed as it is on the top of the base. However there is a potential gotcha: you have to move the OTA (optical tube assembly) to a near horizontal position to be able to access the battery compartment (according to the manual). But you are supposed to use the electric drive to move the tube, meaning you have to have power applied. Changing batteries in the field could be a problem unless you have an alternative power supply. 6. You can align the computer using two known stars without entering your location and the date. This is convenient when doing a quick setup. When entering time you can use a 24-hour clock. You can save up to 10 locations in the computer's memory. 7. Auto-aligning is a two-step process for each star: you center the star in the finder FOV (put it under the red-dot) and accept it, then you center the star in the EP FOV and accept that. The slewing speed and direction changes automatically between these two steps. It seemed somewhat unnecessary for this to be a two-step process but it works OK. You can adjust the alignment during an observing session by aligning on a 3rd star. This is a nice touch. 8. The version of the NexStar5 controller that I received has planets and the Sun in its database of objects but not the Moon (although it does have a lunar tracking rate mode). Unlike with the Autostar, which is user upgradeable, you have to return the controller to Celestron to have newer versions installed. Following the initial release of the NexStar5 without the Moon, a newer release was made that included the Moon. But since Celestron did not respond to my requests, no upgrades were made to the evaluation unit. Just as with the ETX line and an Autostar, the NexStar5 can be pointed with a desktop or laptop computer using the appropriate sky charting software. There is an RS-232 port on the bottom of the handset. One wonders if this could also be used to download new NexStar software versions. Maybe someday. 9. The direction arrows on the hand controller reverse their meaning depending upon the slewing speed. The controller assumes that the user will be using the 1x red-dot finderscope at higher speeds and an eyepiece (with its reversed image) at slower speeds. Some users may become confused by this but you can get used to it. 11. Some readers may believe that there is no backlash on the NexStar5 gears, unlike with the ETX gears. However, the manual clearly states that there is backlash, especially when changing directions. The manual does describe how to minimize the backlash. 12. The manual mentions doing astrophotography with the NexStar5. Some people have commented that the NexStar5 can do long duration astrophotography with the implication that the ETX-125EC can not. What they have neglected to add is that the NexStar5 manual tells you that will need an off-axis guider and a guide eyepiece to do this. If you had these on an ETX-125EC (or even on an ETX-90EC or -90RA with the Microstar Dual Axis Corrector) you could do the same type of long duration astrophotography. Similarly, there have been complaints that the ETX line can not do Prime Focus photography when pointing towards the zenith. That is true for the ETX line when used in Alt/Az mode since there would be insufficient clearance between a camera mounted at Prime Focus and the ETX base. Although I could not verify this (lacking the proper adapters for the NexStar5), I suspect the same problem will occur with the NexStar5; I doubt there will be sufficient room between the camera and the NexStar5 base in Alt/Az mode once you add all the required adapters. The first clear night following my manual reading, I took the NexStar5 outside for its initial use. Not having a tripod especially built for the NexStar5 (which, according to one Celestron dealer's web site, may not even be shipping yet from Celestron), I decided to mount the telescope on a stable flat table top. I used the supplied AC adapter connected to a long extension cord. An extension cord is really necessary because the supplied AC adapter cord is only 6 feet long versus the 25-foot cord that comes with the optional ETX AC Adapter. Following the instructions in the manual, I found that set up of the NexStar5 was very quick, just like with the ETX line. The alignment of the red-dot finderscope was much easier versus the six-screw bracket used with the standard ETX finderscope. I checked the telescope's collimation using the steps described in the NexStar5 manual. This showed that the NexStar5 was in collimation. My first alignment was a two-star align using Vega and Deneb. Several attempts using these stars were unsuccessful; the NexStar5 would report alignment failure. However, using Vega and Altair the NexStar5 did align properly. At this time of night, both Vega and Deneb were at about the same azimuth, and both have about the same declination. Perhaps this condition can cause problems with NexStar5's alignment program. If so, it should be pointed out in the manual to avoid such conditions. I left the scope pointed at Altair and in just a couple of minutes it had already drifted to the edge of the 25mm EP FOV. I then selected to GOTO Jupiter and then Saturn; I had to input the date and time again, which I found annoying since I had put them in at the beginning of this session. Both planets were positioned within viewing through the red-dot finder but were outside the 25mm EP FOV. Just goes to show that alignments may not always be perfect, whether using the NexStar5 or an Autostar/ETX. The NexStar5 drive was louder than the ETX-125EC drive during tracking but much quieter when slewing at high speeds. The focus knob was easy to grasp and rotated smoothly but its size made it necessary to grasp it firmly, yielding more vibrations. Unlike with the ETX-90 and -125, there is no option for a NexStar5 electric focuser from Celestron. The NexStar5 controller was easy to read at night and in the day. But as mentioned earlier, you have to watch where you place the controller while the scope is slewing. I tried placing it on the base top but the base top is convex and so the controller would slide off. During this first night, I noted that there was backlash in the drive gears, as described earlier. On my second night with the NexStar5 I did an Auto Align. Vega (the 1st star) was positioned in the finderscope. The second star chosen by the computer was behind an obstruction. I tried to skip this star and that is when I discovered that, unlike with the Autostar, you have to wait for the NexStar5 to finish slewing before you can skip the selected star using the UNDO button. This became rather annoying since several stars it tried to use were behind obstructions. But it finally picked one that was not and I managed a successful alignment. Unfortunately within a couple of minutes the second alignment star had drifted about halfway to the 25mm EP FOV. I decided to recheck that the base was level; it was (visually, which is what most users would initially do). I then did a GOTO to the Ring Nebula, M57. It appeared about halfway to the edge of the 25mm EP FOV, which was good, and looked similar to what I've seen with the ETX-90RA with a 26mm EP, just brighter. Unlike the Autostar, the NexStar5 controller does not display the name of the selected object once the slewing stops. You have to press the INFO button to see the name. This is not necessarily a problem, just a difference. I then selected the Andromeda Galaxy, M31, which was located near the zenith. Nothing was visible in the 25mm EP FOV. I could not locate it through the finderscope but I could see it in binoculars. I then selected M13, the Star Cluster in Hercules, which was below the horizon. The NexStar5 went there anyway. The Autostar tells you when a selected object is below the horizon but the NexStar5 will merrily slew to this hidden object. Seems like some additional math could have been programmed into the NexStar5's computer to avoid this. On subsequent viewings, I found the following. One time when trying to GOTO M1, the Crab Nebula, the NexStar5 began slewing. The scope rotated about 90 degrees in RA and 45 degrees in DEC, then stopped about 150 degrees short of M1's position. The display still stated that it was slewing and the motors were running but the scope was not moving! Everything seemed locked up as I could not regain control of the NexStar5. Finally, after about a minute I regained control. I was not successful in locating M1. The red-dot finderscope was not helpful as it had no magnification to help me locate M1 using a star chart. This is one of the drawbacks to this type of finder when it is the only finder used. GOTO Jupiter; halfway to edge of 25mm EP FOV. I thought that the image seemed a little blurry, probably due to the long eye relief of the 25mm EP (50x). The image looked much better using a 9.7mm EP (129x). Jupiter appeared much brighter than with the same 9.7mm EP on the ETX-90 (same focal length, 1250mm, as the NexStar5). Several bands were prominent. With a 4.7mm EP (266x), the moons that were visible were not very sharp. Then it was on to Saturn; no details other than a ball and ring were visible in the 25mm EP but with the 9.7mm some bands were readily apparent. I could just barely detect the Cassini Division. With the 4.7mm EP no details were visible due to the fuzziness of the image. In general, I was comfortable using the NexStar5. The views through it are similar to what is seen with the ETX-90 with the same eyepieces, although the images are brighter in the NexStar5 and you can use higher magnifications, as to be expected with its larger aperture. There was no significant image shift. Images were stable, with hand-induced vibrations quickly damped out. However, the size of the focus knob made it difficult to quickly get a good focus; it was necessary to adjust the focus, wait for the vibrations to dampen out, then do a little more adjustment, wait for the vibrations to dampen out, and keep repeating the process until a good focus is reached. It seemed to take more work to get a good focus with the NexStar5 versus the ETX-125EC. The drive tracks smoothly, although a little louder than the ETX line. Slewing is much quieter, as previously noted. The NexStar5 is easy to carry by the fork arm (something I felt uncomfortable doing with the ETX-125EC). It has a nice feel in your hand (the fork side is curved versus the flat surface on the ETX fork arm). The standard configuration NexStar5 price is $1199, which includes a 25mm Plossl eyepiece, visual back (required), star diagonal, the computer/controller, and an AC adapter. Once I felt comfortable with the quirks and usage of both the NexStar5 and the ETX-125EC, I proceeded to do the side-by-side comparisons. As mentioned at the beginning of this report, a local astronomy professor joined me for a night's session and brought along his Celestron C5+. We'll call him "Martin", the name of one of my astronomy professors as an undergrad in Astrophysics in the 1960s and not this person's real name. I also set up my ETX-90RA as part of the comparison. 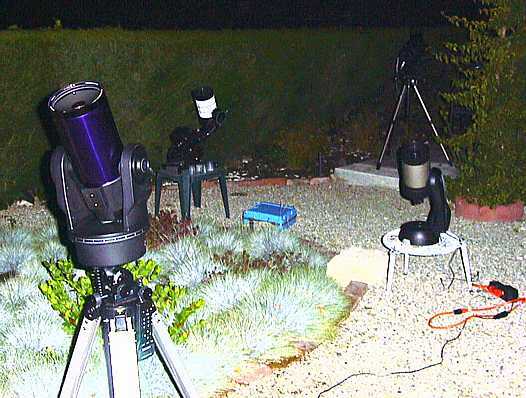 This photo shows my backyard with all the scopes set up at night. Left to right: ETX-125EC, C5+, ETX-90RA (rear), NexStar5 (front). The following table summarizes some of our experiences with each telescope, eyepiece, and selected objects. Jupiter 48x. Good. 2 bands easily seen. 73x. Larger image. Brighter than in ETX-90RA. 3rd band visible. 50x. Same as ETX-90RA. 3rd band was prominent. 48x. Essentially the same as NexStar5. Saturn 48x. Good. Ring easily seen. No Cassini Division. No bands. 73x. One band visible. 50x. Same as ETX-90RA. 48x. Same as ETX-90RA. Saturn 63x. One band visible. No Cassini Division. 95x. One band visible. Cassini Division visible. 63x. Same as ETX-90RA. 63x. Same as ETX-90RA. Saturn 129x. One band, Ring shadow, Cassini Division all visible. Not as bright as with 5" scopes. 196x. One band, Ring shadow, Cassini Division all visible. Not as crisp as in C5+. 129x. Same as C5+. 129x. One band, Ring shadow, Cassini Division all visible. Crisp view. Saturn 266x. Fuzzy. Could just barely make out band, Ring shadow, and Cassini Division. 404x. Fuzzy. But Division more readily visible than in NexStar5 and C5+. 266x. Brighter but essentially the same as the ETX-90RA. 266x. A little better than the NexStar5. Less fuzzy. M42 in Orion 48x. Nice. Trapezium easily visible. Same details in the nebulosity visible. 73x. Nice. Trapezium easily visible. More details in the nebulosity visible than in ETX-90RA. 50x. Nice. Trapezium well defined. Consider details seen (although hard to get it all in focus). 48x. Nice. A little better than the NexStar5. M42 in Orion 31x. Lower contrast than with 26mm. 48x. Lower contrast than with 26mm. Could still separate Trapezium stars. 31x. Lower contrast than with 25mm. Could not separate Trapezium stars. 31x. Lower contrast than 26mm. Could still separate Trapezium stars. A good test that was suggested Martin was a faint star embedded in some of the nebulosity of M42 in Orion, near the Trapezium. The chart on the right shows this star (please, no comments on my lack of artistic talents!). This star was easily seen in the ETX-90, ETX-125EC, and Celestron C5+, but not very easily seen in the NexStar5 during this comparison. The drive sounds were noticeably different when side-by-side. The ETX-125EC has a "whine" sound. The NexStar5 has a louder "chunka chunka" stepping motor sound. If the sound and/or volume is important to you, you may wish to visit your local dealers and have a listen to determine if either might be annoying to you. The C5+ and ETX-90RA had quieter drives but were equatorially mounted instead of in Alt/Az as were the ETX-125EC and NexStar5. Tracking by all telescopes was very good tonight. Whether equatorially mounted, like the ETX-90RA (with a Scopetronix Microstar II+) and the C5+, or altazimuth mounted like the ETX-125EC and the NexStar5, the drives with and without computers did the job. Martin felt that the NexStar5 motors were too noisy compared to the ETXes and the C5+. He also noted that it was difficult to find the focus "sweet spot" with the NexStar5 versus the ETX-125EC and C5+. He felt that the focus knob was difficult to finely adjust due to its size and the wide knurling on the NexStar5 knob versus the C5+ and the ETX-125EC focus knobs. While the C5+ and ETX-125EC focus knobs could be turned with the thumb and forefinger, the NexStar5 focus knob had to be turned by rotating the wrist. This resulted in more induced vibrations that had to be damped out before continuing to focus. This is an area where the metal versus plastic argument has no bearing. The vibration was there even with the metal structures used in the NexStar5. Martin mentioned that there appeared to be significant play in the focus mechanism of the NexStar5 unlike with his C5+. His recommendation was to find a Celestron C5+ and skip the computerized NexStar5 and ETX-125EC. He noted that C5+ telescopes are being discontinued and sold for $999 with a tripod. So he feels that unless you really need the computer, it is a better deal than the NexStar5 and perhaps even better than a comparably equipt ETX-125EC. However there are probably very few C5+ telescopes left out there for sale. In otherwords, Dr. Martin prefers his C5+ and will not be trading it in for a NexStar5. Both the NexStar5 and the ETX-125EC currently remain in short supply, due in part to the popularity of both scopes. Both scopes have their good features and their faults, with no clear advantage to one or the other as a total system. Optically, I preferred the views through the ETX-125EC over any of the other scopes due to its longer focal length. Physically, I felt more comfortable with the NexStar5 although I do not like its focus knob and mechanism, its rotating base taking the cords with it, and its louder tracking drive. As to the computer GOTO system, I felt that the Autostar is a better product with more capabilities and it is user upgradeable. I do like the NexStar5 hand controller with its labels allowing easy access to information (planets, stars, nebulae) as opposed to the menu/submenu navigation with the Autostar. Neither computer system will work perfectly all the time, every time, but if you understand the limitations they can do the job of helping the user locate objects and provide celestial tracking when the telescope is Alt/Az mounted. A similarly configured ETX-125EC will cost about $100 less (US Dollars) than the NexStar5. If you are looking for a 5" telescope without computer control, the ETX-125EC makes a nice choice because you don't have pay for the computer system that you don't want, thereby saving about $300. Plus it provides the advantage of upgrading it later with an Autostar. Meade has about a six month lead over Celestron with this type of GOTO system (telescope/computer combination). I am certain that Celestron can address the shortcomings mentioned here just as Meade will likely be improving the ETX line and Autostar systems. As each company releases new versions and models there may be some "leapfrogging" as one company and then the other develops new capabilities. But first Celestron must make some changes in the NexStar5 design: at least make the computer software user-upgradeable and change the focus knob. Other design enhancements will likely come along in time. Of course, Meade will not be standing still either. This is good for all of us. It is unfortunate that the ETX-125EC had some flaws when first released. While these have now been overcome, its (and Meade's) reputation have been damaged. When the Autostar was first released with the ETX-90EC, there were some bugs in version 1.0, resulting in user complaints. Meade has addressed these and the Autostar works as described here. Both of these examples show that Meade will correct reported and verified problems. Celestron has also demonstrated that it will correct problems with its products. They released new NexStar5 software to add the moon shortly after the public complaints began. If I were planning to buy a 5" GOTO telescope system today, based on the comparisons reported here I would buy the ETX-125EC as it better meets my requirements. Readers will have to make their own decision on what is right for them, keeping in mind the pros and cons of both systems. As long as you buy from a reputable and authorized dealer you really won't go wrong with either telescope if it meets your requirements.